NAPLES, Italy -- NATO's military commander expressed concern Tuesday over an increasing flow of weaponry and military supplies to Russia-backed separatists in eastern Ukraine, as European observers in the region reported seeing another unmarked military convoy near the rebel stronghold of Donetsk. 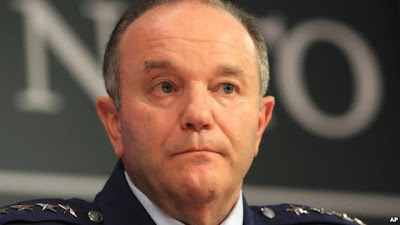 NATO's Supreme Allied Commander Europe U.S. General Philip M. Breedlove. Speaking to reporters at a NATO air base near Naples, Italy, U.S. Air Force General Philip Breedlove said he was “concerned about the increased movement" of armored weapons and other military equipment into eastern Ukraine, adding that more have been seen "in the past several days," Reuters news agency reported. The NATO commander said at least 250-300 Russian troops remain inside eastern Ukraine helping the separatists. He also said that eight Russian battalions remain on Russia's border with Ukraine, and that Moscow is moving forces capable of using nuclear weapons into Crimea, which it annexed from Ukraine in March. Organization for Security and Cooperation in Europe (OSCE) monitors in eastern Ukraine reported Tuesday seeing a convoy of unmarked green military trucks, with tarpaulin covers, just outside of Donetsk moving toward the city center. The monitors said five of the trucks were each towing 120 millimeter howitzer artillery pieces, while another five were each towing partly-covered multi-launch rocket systems. Also Tuesday, Ukrainian military spokesman Colonel Andriy Lysenko said that what he called "Russian mercenaries" are "strengthening and reinforcing" rebel forces in the immediate vicinity of the "line of confrontation." A spokesman for Ukraine's Foreign Ministry said it had delivered at note of protest to Russia's Foreign Ministry in connection with what it called ongoing acts of "aggression" against Ukraine. On Friday, Kiev accused Moscow of sending more than 30 tanks and truckloads of troops to support the pro-Russian rebellion. Moscow has repeatedly denied any official military involvement in Ukraine, and has described Russian troops fighting alongside rebels as volunteers. Spokesman Lysenko said Tuesday that five servicemen had been killed and 10 wounded in fighting over the past 24 hours. He said that as of October 11, 1,052 Ukrainian servicemen had been killed, 4,079 had been wounded and some 400 had disappeared since the conflict started in mid-April. According to the United Nations, more than 4,000 people have died in the conflict in eastern Ukraine. British Prime Minister David Cameron said “Russia's relationship with the rest of the world will be radically different in the future" if it continues what he called Moscow's "illegal actions in Ukraine." In a speech Monday, Cameron said Russia's actions are "destabilizing a sovereign state" and pose a "grave danger to the rest of Europe," 25 years after the fall of the Berlin Wall. "[Former Soviet leader] Mikhail Gorbachev has warned that we are on the brink of a new Cold War. That is not an outcome we believe to be inevitable, and neither it is one that we seek. And I will make that clear to President Putin in Brisbane this weekend,” said Cameron. Cameron promised to tell Russian President Vladimir Putin at the G20 meeting in Australia that if Russia continues its actions in Ukraine, then Britain and its allies will keep upping the pressure. The United States has been a strong proponent of European Union sanctions against Russia. Russia has repeatedly denied any official military involvement in eastern Ukraine. Moscow has described Russian troops fighting alongside pro-Russian separatists as volunteers. The prime minister said Russia was violating Ukraine's territorial integrity. "They are ripping up the international rule book. They are disregarding the democratic will of the Ukrainian people to decide their own future," said Cameron. He said there were further reports of shelling and of more heavy weapons moving from Russia into southeast Ukraine this past weekend. European Union foreign ministers will meet in Brussels next week to discuss the possibility of new sanctions against Russia as well as efforts the bloc could take to support Ukraine, EU foreign affairs chief Federica Mogherini said on Tuesday. “Next week we will have a ministerial meeting in Brussels on Monday and there will be a discussion there, but I would say not just on whether to increase the sanctions but most of all how to support Ukraine in these difficult times,” Mogherini told reporters in Berlin on her first visit to the German capital as the EU's high representative for foreign and security policy. Meanwhile, German Chancellor Angela Merkel said on Tuesday that further sanctions against Russia were not planned at the moment. Merkel said she would speak to Ukraine's President Petro Poroshenko and Russia's Vladimir Putin and reiterated her intention to have EU travel bans extended to newly-elected separatist officials in eastern Ukraine. “Beyond that, further economic sanctions are not planned at the moment; we are focusing on the winter and the humanitarian situation there and how to get a real ceasefire,” said Merkel. A truce deal signed by the sides September 5 has been deteriorating rapidly over the past weeks, with heavy shelling reported around the separatist stronghold of Donetsk.